Mary and Wade welcome you to Panorama Motor Lodge, situated on The Bay Hill in central Timaru and overlooking beautiful Caroline Bay. A large, modern motel complex with a great choice of accommodation options from studio units to family units. Enjoy a superb location close to the beach, with coastal and mountain views, yet next door to all city facilities. 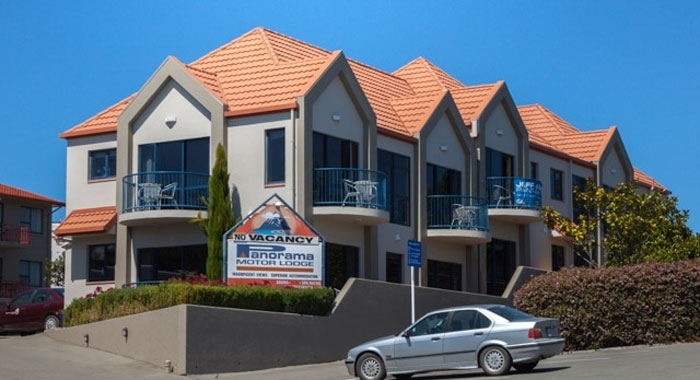 Panorama Motor Lodge is close to cafés and restaurants, is only a 3-minute walk to the CBD and has panoramic sea or city views from most units. It is ideally suited for corporate customers, travellers and families. There is a range of units including studio, 1-bedroom and 2-bedroom family units, together with off-site self-contained apartments able to cater for up to 13 people. They are spacious with modern decor and free WiFi is available to all guests. Timaru is situated on the main coastal road between Christchurch (2 hour drive) and Dunedin (2.5 hour drive). We are also close to the route to Aoraki Mt Cook, being a 1.5 hour drive away.